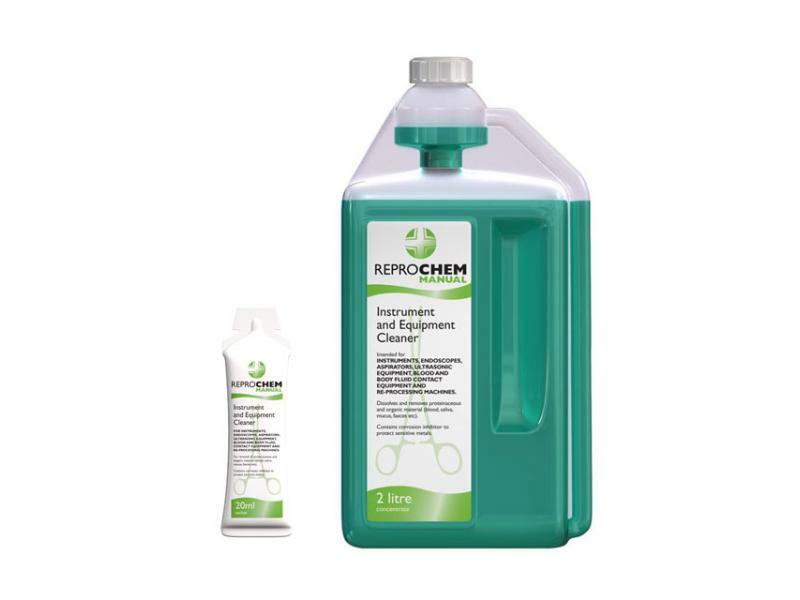 REPROCHEM MANUAL Enzymatic Instrument and Equipment Cleaner is a multi-enzyme detergent concentrate which dissolves and removes proteinaceous and organic material (blood, saliva, mucus, etc) from the surfaces of instruments and equipment. 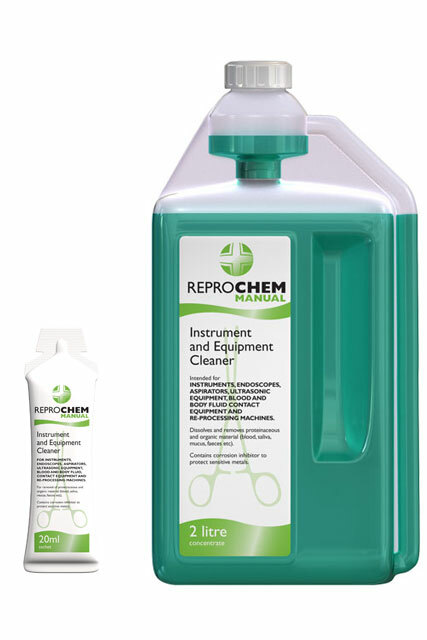 REPROCHEM MANUAL is non-foaming (designed as a pre-autoclave or automated system cleaner) and non-corrosive (safe on all metals, plastics, rubbers, etc) It is intended to be used on Instruments, Endoscopes, Aspirators, Ultrasonic Equipment, Blood and body fluid contact equipment and Re-processing machines. Most cleaning substances find these instruments very problematical because of their intricacy of design. REPROCHEM MANUAL really comes into its own on these instruments. Its use is strongly recommended rather than the use of conventional soap/detergent solutions or even surgical scrubs which are not designed for the purpose. Rubber, latex, various plastics can become embrittled if subjected to the wrong type of cleansing agent. REPROCHEM MANUAL will not present the same problem. REPROCHEM MANUAL can be diluted 1 part in 100 parts of water for use as a flushing solution (use recommended machine times) in automatic re-processing machines, ultrasonic baths and other automated instrument cleaning systems. REPROCHEM ENZYMATIC is manufactured to the highest standard in accordance with a Quality Management System accredited to ISO9001:2008. The imperative of securing absolute cleanliness and high level disinfection of medical instruments has never been more sharply focussed. The Hospital Infection Research Laboratory in Birmingham makes clear that meticulous cleaning of instruments prior to their disinfection is an bsolute pre-requisite to their re-processing for future use. This advice is reflected also by the guidelines issued by the British Society of Gastroenterology and the Infection Control Nursing Association. There are currently no questions for Reprochem Enzymatic Instrument and Equipment Cleaner - be the first to ask one!